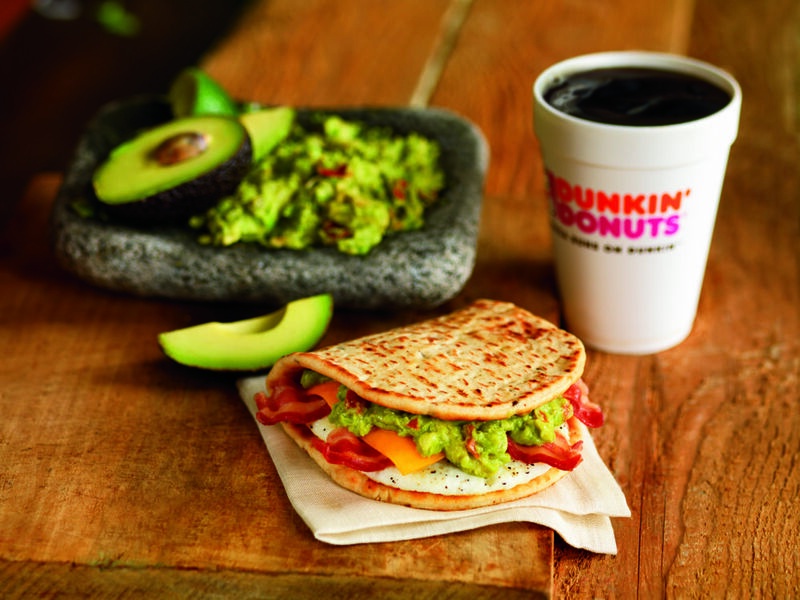 CANTON, MA (April 27, 2015) – This spring Dunkin’ Donuts is introducing guacamole to its nationwide menu for the first time in brand history with the new Bacon Guacamole Flatbread Sandwich. The new sandwich, available now through May at participating Dunkin’ Donuts restaurants throughout the U.S., includes two strips of bacon, egg, a slice of reduced fat cheddar cheese and authentic guacamole that features a zesty mix of Hass avocados, cilantro and lime juice. 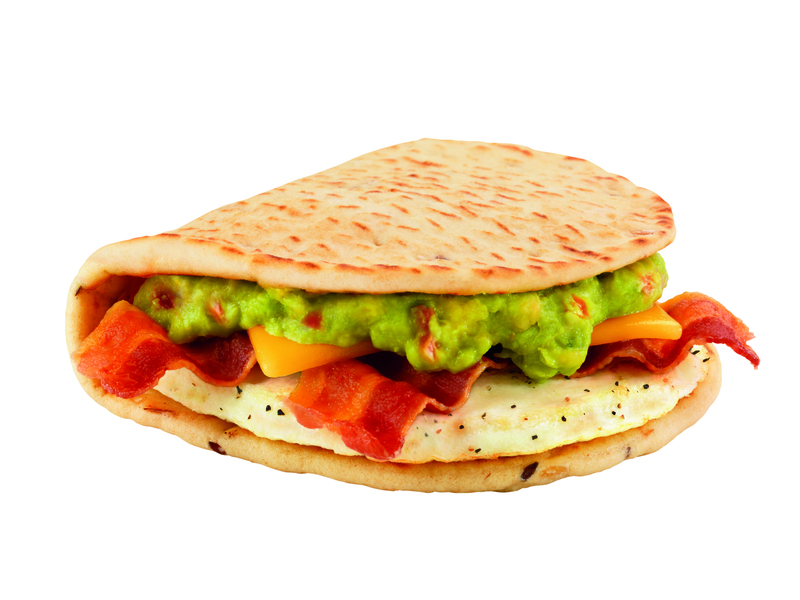 Dunkin’ Donuts’ guests can enjoy guacamole around the clock, as the new Bacon Guacamole Flatbread Sandwich – like all Dunkin’ Donuts breakfast sandwiches – is served any time of day. With several breakfast sandwich choices featuring favorites such as cherrywood smoked bacon, Angus Steak, aged cheddar cheese, freshly baked croissants, bagels or toasted English Muffins, Dunkin’ Donuts provides delicious and satisfying options for guests to start the morning and keep running any time of day as well. Dunkin’ Donuts also offers a full lineup of bakery sandwiches, available all day, such as Bacon Ranch Chicken, Turkey, Cheddar & Bacon, Chicken Salad, and Tuna Salad sandwiches. As the weather starts to heat up all around the country, Dunkin’ Donuts is also helping people sip their way to summer by serving Coolatta® frozen beverages, to help people keep their chill. Dunkin’ Donuts today introduced the new Mango Passion Fruit Coolatta®, offering the perfect balance of mango and passion fruit flavors in a frozen refreshing beverage. The brand has also partnered with Arizona Beverages and Arnold Palmer Enterprises for the return of the Frozen Arnold Palmer Coolatta, a frozen way to enjoy the original half iced tea, half lemonade beverage. Both Coolatta varieties are available at participating Dunkin’ Donuts restaurants for a limited time. Now through May, guests can enjoy any small Dunkin’ Donuts Coolatta frozen beverage for the special price of $1.99. In addition to Mango Passion Fruit and Frozen Arnold Palmer, Dunkin’ Donuts’ Coolatta frozen beverage lineup includes fruity flavor favorites such as Strawberry and Minute Maid® Orange. Also, for a perfect way to beat the heat at work or play, guests can enjoy Dunkin’ Donuts’ Frozen Coffee Coolatta, a delicious frozen coffee-flavored beverage, as well as the Frozen Mocha Coffee Coolatta, the Frozen Caramel Coffee Coolatta, and the Vanilla Bean Coolatta.